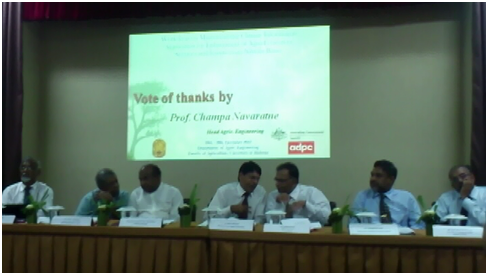 Workshop on “ mainstreaming Climate information application for Enhancement of Agro ecosystem services and functions in Nilwala River Basin, Sri Lanka, held in the Auditorium of the Dept. of Agric. 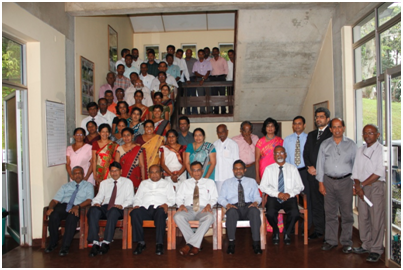 Engineering, Faculty of Agriculrture, University of Ruhuna on 19th Decmber 2012 followed by a field visit to Nilwala basin on 20th December, organized by the ADPC, and University of Ruhuna. Minister of Agriculture, Hon. 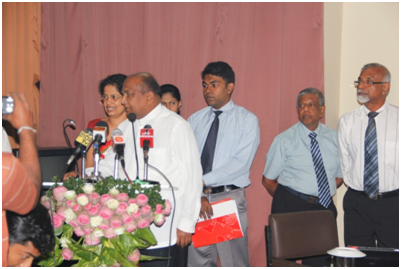 MahindaYapaAbeywardana was the chief Guest. Additional Secretary (Technical) to the Ministry of Agriculture, Dr.D.B.T.Wijerathna Chaired the technical session. More than 60 stakeholder participants coming from Government, academia, community, and Non-governmental organizations were attended the workshop. The Secretary to the ministry Dr. Wijerathna has pointed out the escalating problems and threats on Agriculture due to climate change and stressed theimportance of the adaption of appropriate strategies. Sri Lanka is the 17th Nation who uses fertilizer extensively along with extra ordinary dozes of Pesticides (4.2 l/ha). Therefore Adaptation of appropriate crop at the correct time is very much important. The Secretary congratulated ADPC and the University Of Ruhuna for embarking into a very important Research and Development program on mainstreaming Climate information application for enhancement of Agro Eco Services and Functions in the Nilwala basin and expressed his willingness to be with the project with the blessings of the minister for what ever the assistance needed from the ministry side. The Minister of Agriculture, Mahinda Yapa Abeywardana has brought to the notice of the audience the inadequate attention paid by agencies to meet the challenges of climate change and associated problems, even though lots of dialogues are in place. Since the country has emerged to a rapid development pathway after ending the prolonged war, the role of intelligentsia is now very much in need to prepare the plans for a clear future for the country. Minister has stressed the unexpected flood incidents occurred in Kurunegala, in the year 2012, which had no historical records of any types of floods in the past.